Matthew Kelty, a native of Boston, has been a monk of Gethsemani since 1960. Before that he served as an active priest in the Society of the Divine Word, both in the States, and in Papua New Guinea. His previous books include Flute Solo (Sheed, Andrews & McMeel), Sermons in the Monastery, Call of the Wild Geese, and Singing for the Kingdom (Cistercian Publications). He was a novice of Thomas Merton, who later chose him as his confessor. After some years at Gethsemani, he became a hermit for ten years in Papua New Guinea. After returning to the monastery, he became chaplain to the guests and retreatants, to whom he gave a spiritual conference each evening after Compline. 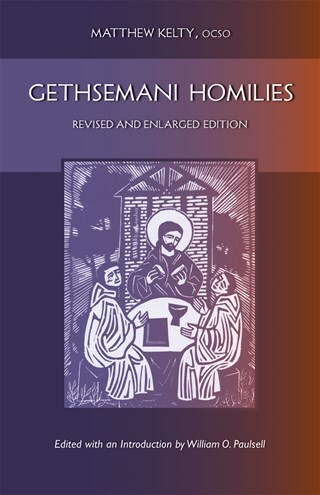 Gethsemani Homilies: Revised and Enlarged Edition was first published by the Franciscan Press in Quicy, Illinois, but after a short time the Press closed down, and the manuscript was returned to Gethsemani. The editor, William O. Paulsell, has revised and enlarged the edition that we have here.